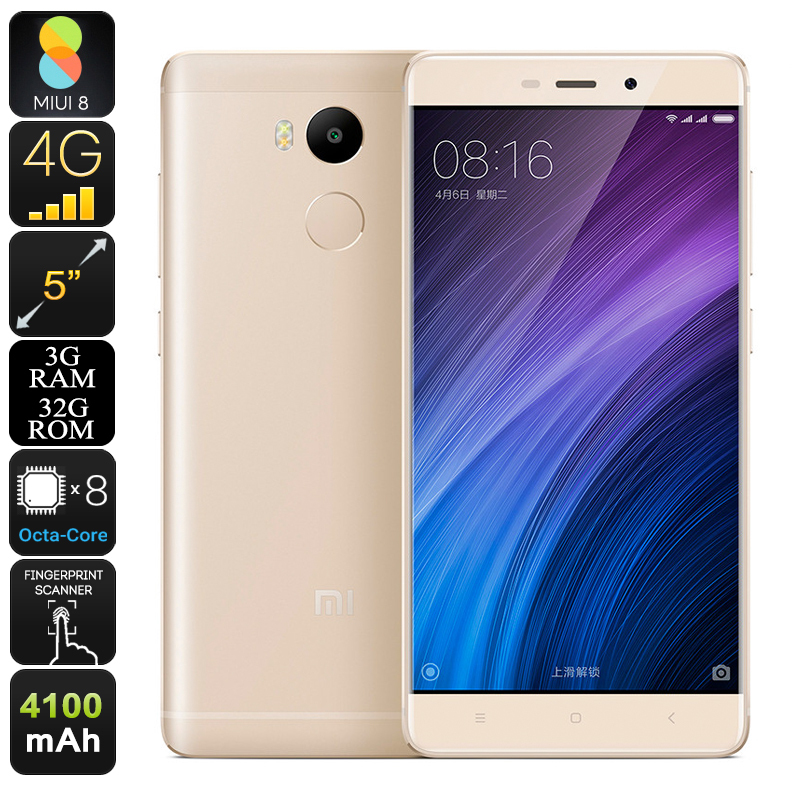 Successfully Added HK Warehouse Xiaomi Redmi 4 Prime Smartphone - Android 6.0, 4G, 4100mAh Battery, Fingerprint Sensor, Snapdragon CPU, 3GB RAM to your Shopping Cart. A 64Bit Octa core, snapdragon CPU alongside 3GB of RAM ensures the Redmi 4 bursts onto the scene as a new mid-range contender to spend your cash on. Basically, this is the best new value mid-range phone on the market and a great replacement to the Redmi 3. The Redmi 4 looks the part as well with its 2.5D arc glass, metal frame and brushed metal finish this uni-body phone is a real eye pleaser. Running on an octa-core Snapdragon 625 CPU, clocked at 2.0GHz and 3GB of RAM the Redmi 4 smartphone can easily handle multitasking, streaming media and with its Adreno 506 GPU graphics the latest games will run smoothly as well. Xiaomi have placed their very own MIUI 8.0 operating system on this Android phone and being based on the Android marshmallow operating system it brings all the features you'd expect and love from Android 6.0, such as now on tap, add to that a nice helping of Xiaomi functionality and you get a solid and reliable interface that generously adds to the user experience of the Redmi 4. On the rear of the phone is the fingerprint sensor that not only unlocks the phone but can be used for authorizing secure payments or snapping selifeis. above that is a 13MP camera that ensures those memorable moments are captured in great detail as with the dual tone LED flash you get stunning shots even in low light and its ability to record full HD video is a great bonus that will see you sharing clips on social media. There's no need to worry about upload and download speeds because as well as its excellent Wi-Fi abilities this Smartphone has 4G connectivity, this lets you tap into the fastest cellular data connections on the go which will make slow uploads and laggy download as thing of the past as you'll get speeds that5 can support streaming HD video with ease. The Xiaomi Redmi 4 is available now and comes with a 12 months warranty, brought to you by the leader in electronic devices as well as wholesale Android smartphones..
An excellent phone and great value for the money. It does everything I want and expect in a modern smart phone. the fault of Chinavasion. West coast Canadian winter snowstorms delayed its journey to my house on the East coast!